Once upon a time, I had a tree. I can’t say that I luuuuuved the tree, but it was nice and green and really looked cool in front of my house. Now I own a feng shui collection of sticks planted in my front yard. I look like I’m protesting something, only I forgot to tell people what. 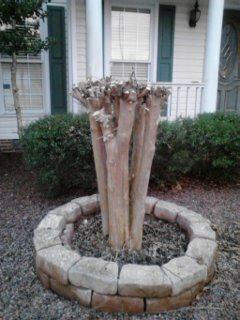 THIS, my dear friends, is what we in the South refer to as “crepe murder,” a process in which some hapless man doing yard work comes along and gets frustrated with removing every delicate limb of last season’s growth off a crepe myrtle tree, and just hacks it. You’re probably already thinking, “Gosh, Lorca, it’s like all you ever do is complain about something your husband did around the house.” HA! Shut up! My husband didn’t do this! So there! Sorry, that was harsh. I got another look at my tree picture and took it out on you. No, my husband didn’t do this. Last weekend, a man literally pulled up in our driveway, revved up a chainsaw, and cut my tree off and took the limbs away in the back of the truck. No, we did not call the police and report an arborcide. We just waved. We know him, he’s elderly, he’s crazy, and it kind of keeps me awake at night that he’s still allowed to drive a car. But he was holding a chain saw and there was no way in hell I was gonna say something to him about my tree. It’s just a tree. This picture would have looked very different if he had decide to lop my legs off. The tree will be back in bloom eventually and most likely outlive the old guy. Trees live longer than us and with the exception of old guys with chainsaws they have it fairly easy. You’re right, I’m looking at this all wrong. I should be pointing at the tree and laughing since it doesn’t do anything but stand there and look pretty. I wish I just had to stand there and look pretty. Now I can mock the tree and shame it for its laziness. Hmmm most fashion models are a bit like trees then. Same IQ, probably. I wonder if they get worried about old men with chainsaws? Yikes! I hate it when old guys prune my yard. My dad was looking for something sharp the last time I had him over. Thankfully I was able to distract him with grilling and beer. The time before that was my father in law. He’s about that crazy, by the way… Please don’t tell my wife I said that. Lucky you!! I have to beg and plead with my dh to prune vegetation. He thinks all that leaf and limb is a good thing and the poor things can’t feed it all. Sort of a tree version of the old woman who lived in a shoe. Send a picture of all the lovely blossoms next spring! I’m hoping that he knew what he was doing and did you a favor. Maybe his “murdering” of the tree will bring it back, better than ever? And yes, I’m glad he left your legs alone. And I think I would lie awake at night more concerned about the fact that he has access to a chain saw than a car. True, but at some point the upper body strength to rev a chainsaw will fail him. The car? He just has to turn that key. I’m relieved he didn’t lop your legs off. Me too. It would not be as amusing as the tree lopping. It will be back even lovelier than before… next year. The power of vegetation has been and will always be much better than the power of muscle, bones and blood. Just writing the bones and blood part makes me sort of gag up bile into my throat.